When it comes to weight loss, monitoring your body composition can be just as helpful in assessing your progress as tracking numbers on a scale. The skinfold test, which involves measuring the thickness of subcutaneous fat at specific sites on your body, is widely used by fitness professionals to estimate both body density and body fat percentage. The method isn’t foolproof -- body fat estimations based on skinfold tests have about a 3.5 percent standard error rate, according to the American Council on Exercise. But its relative accuracy makes it a valuable assessment tool. 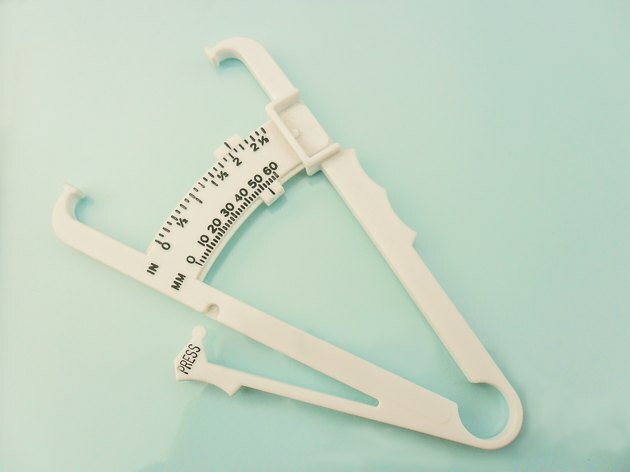 The Jackson-Pollack method for evaluating body fat percentage requires three skinfold measurements. For men, measurement sites are the chest, abdomen and thigh; for women, they consist of the thigh, triceps and suprailiac crest, or just above the top of the hip bone. Because measurements are taken in very specific spots, precise locations are typically measured and marked with a washable marker before the test is conducted. For consistency and accuracy, all skinfold measurements are taken at least twice on the right side of a standing, relaxed body and should never be taken after exercise, when a person’s fluid levels can interfere with accuracy. The Jackson-Pollock Formula is not a direct assessment of body fat percentage. Rather, it’s a measure of body density -- total body weight relative to the area it occupies -- that can be used to estimate body fat percentage. While there are many different ways to calculate body density, the Jackson-Pollock formula is widely used because it’s a generalized calculation, meaning it can be accurately applied to a wide range of populations. Body fat percentages can be classified as essential, athletic, fit, acceptable or obese, according the American Council on Exercise. Because women typically have more body fat than men, each gender has distinct percentage ranges. For women, 10 to 13 percent of body fat is considered essential, while for men, just 2 to 5 percent of body fat is essential. Female athletes normally have body fat in the range of 14 to 20 percent, while the percent body fat of male athletes typically ranges from 6 to 13 percent. Women with 21 to 24 percent body fat, and men with 14 to 17 percent body fat, are considered fit. An acceptable body fat range for the average person is 25 to 31 percent for women and 18 to 24 percent for men. Women whose body fat is over 32 percent and men whose body fat is over 25 percent are classified as obese.